For the kind of competition level that we play and depth our our schedule, these roster sizes are on the small side. Local teams and programs that claim to operate on 12-14 player rosters at HS ages do not understand this because they do actually compete at high level national events.. We could play local tournaments vs. local teams with 12-14 kids per team. But, that is not what our program is about. We compete at the highest level nationally, especially with our Blue teams. Our 15 Blue, 16 Blue, 17 Blue teams were 17-6-1 in WWBA pool play this summer in ATL. (note — only two other programs in the region even sent 15u, 16u and 17u teams to the WWBA event in ATL). Our 16 Blue and 17 Blue teams just finished playing 47 games in 52 days against top competition in front >>100 college coaches. This is a physically taxing grind. If anything, Gamer rosters sizes are too small for this schedule. Most of the teams we play against at the national level have 20+ players on the roster. It is incredibly hard to play 5+ games every weekend with less that 18-21 players at this level of competition. In addition, our teams actually practice 2x per week during the season. This is how we develop players. Our practice schedule insures that players that do not get as many game reps get a chance to compete and improve outside of games. Same thing with our 90 minute pregame sessions. It insures development and reps outside of games. Teams with 12-14 players on the roster simply do not play and compete at the same level that the Gamers play. So, if someone is saying this … they are either misleading you OR are simply out of touch with the level of competition at national travel baseball. Youth baseball has changed a lot in the past decade and is changing every year. We deviated from this some this year (2018) and are not happy with the results. We carried more players at 14u in 2018 because we had three 13u teams moving to 14u the prior year and wanted to give more 14u players a chance to experience the Gamers 14u program. We carried small rosters at 15u and 17u, with the idea that we would move players around between age groups once the grind of the summer season started. That happened a lot during June when we had 14’s playing 15 and 16’s playing at 17. But, when the 14u Atlanta trip came around, we moved the 14’s back to their age level to better compete in ATL and other events. And, the 14u players wanted to play with their 14u teammates in the big events, which is understandable. So, we never fully moved the 14u players to 15u. After June 30th, we realigned the 15-17u rosters from 6 teams down to 5 teams and kept the 14u players at 14u. So, for much of April, May and July, we had too many players on our 14u rosters (15 on 14 Gray and 16 on 14 Blue). This was a mistake on our part. However, despite this, the 14u teams played more baseball than any other 14u teams in the region, with ONE WEEKEND off between mid April and the end of July. Our 14Blue players played in 57 games and practiced 32 times between April 1 and July 22nd. Our 14 Gray players played 48 games and practiced 32 times during the same period. This is on top of the 24 practices in the offseason. When other teams were rained out or snowed out on April weekends, we practiced in our indoor facility. There is no other baseball opportunity in the region that offers this kind of baseball experience. Although the roster size was bigger than planned, the players played A LOT of baseball, developed as players and got a taste of what it takes to compete at a higher level. I was recently reminded of this blog post from 3 years ago regarding the silliness of showcase organizations measuring and reporting Exit Velocity in an uncontrolled fashion with pocket radars, cage balls and random front toss. Thanks to Hittrax, Rapsodo and Diamond Kinetics for bringing order to this chaos. Data that is accurate and meaningful. Unfortunately, I understand that there are still showcase guys with pocket radar on one hand, tossing mushy cage balls in the other and writing down random results in the other. If you are going to measure and report data on players, please spend some money to make it accurate and make players swing wood bats to eliminate doctored metal bats from the equation. Incredibly stable and consistent. Set it up once and it will throw strikes in a small diameter zone for hours. Precise digital control – change speeds, location, etc.. with simple electronic controls. No knobs. Can move from 95 mph fastball inside to a 87 mph slider away in 8 seconds, with up to 10 pitches in a pitch sequence. Can throw literally any pitch by controlling spin rate and direction. A ball feeder that holds 150 balls and visibly feeds a ball every 8 seconds down a 2 foot ramp. Our hitters now see game velocity and movement a lot more frequently. The impact was directly measurable last fall. HS age hitters hit 50 points better with 80 points higher Slugging Percentage compared to the previous fall. Our goal is to continue this transition to challenge our hitters more frequently with more game like velocity and movement. For this offseason, we built a new cage to house the eHack plus the new version of Hittrax. We want players taking around 25% of their swings at this station. So, at least 20 swing off eHack/Hittrax, with the same number off BP, front toss and tee drills in the regular cages. This is in addition to the Gamers bat speed program that is roughly 50 swings each practice. The goal is 150 monitored swings, 2x per week during practice. Non-pitchers get more swings than this. Two way players and catchers need to really work to get their 150 swings in. We began the offseason hitting with the eHack at 35 mph from 35 feet. We have progressively worked back to 74 mph from 55 feet so far, and will end up at 85 mph at full distance in February (we are running a little ahead of plan right now!). We are also alternating the eHack between 2 feet from the right side and 2 feet from the left side to mimic pitcher release point and will add offspeed and breaking balls in February. There is no doubt that hitting off a pitching machine is different from hitting off of a live pitcher. There is a lot more information to pick up from a live pitcher compared to an inanimate machine with a ramp. That is why we have partnered with Axon Sports on pitch recognition for our HS players. You cannot see enough live pitching. But once the ball is in the air, it does not matter whether it comes out of a machine or a pitchers hand. MLB hitters do not get their stride foot down until well after the ball leaves the pitchers hand. A lot of players struggle to hit off the eHack and end up getting frustrated or worse skipping the hitting rotation in the eHack cage. This has increased as the velocity gets cranked up to more game like conditions. Hitting versus game pitching is supposed to be hard! 100% of players that hit well off the eHack also hit well against very good live pitching. Success off the eHack translates to success off high level game pitching. Some players that do not hit well off the eHack still hit well off good live pitching. There are a handful of swing issues that make hitting off the eHack difficult. These are the same issues that we often see in games versus live pitching. What are those swing issues? Rigid, inflexible timing and rhythm approach – everything that leads up to firing the swing is so choppy and timing in so rigid that the player has to be perfect to square a ball up. It’s the old 1 – 2 – 3 – swing approach. The start/stop swing doesn’t work with a ball moving 80+ mph. You cannot be perfect every time. You still need to hit the ball hard without being perfect. Hands and/or bat start from a weak/stalled position when firing swing. This is related to the issue above. It is hard to get a barrel moving if it starts out stationary (physics term is inertia). Same thing with muscles, it’s easier to change directions or go from slow to fast that it is to go from a dead stop. Barrel is not on plane with the ball on time, or long enough. A 80 mph pitch is moving 117 ft/sec and is in the hitting zone for 0.03 seconds. That is not much time! A BP pitch at 40 mph from 30 feet may have the same reaction time as a 80 mph pitch, but the ball is moving a lot slower — only 58 ft/sec and is in the hitting zone 2x longer. To succeed consistently against baseballs moving 110+ ft/sec you need to get the barrel in the zone on time and keep it in zone as along as possible. All of the swing issues above are things players have been working on and need to continue to work on to improve. For example, the med ball drill is great for the first two issues above. The details are highly individualized and left to our hitting coaches to address with support from the Hittrax data and video, Rapsodo data and Diamond Kinetics swing data and Google Classroom assignments that are available to you. He then starts overswinging, becoming off-balance and disconnected. This leads to all three issues above. Rigid timing, locked up hands and late/short barrel path. Is this mental or physical? Who cares — it is real and we can see it. The more he fails, the harder he tries, making the problem worse. He extends the round by 5 swings because of failure, which makes it even worse. After the round, the player is frustrated and loses focuses, either blaming an inanimate machine, his bat or something else. Everything except for the process factors that where just explained above. Sound familiar? It looks a lot like in-game hitting to me. It is a complicated maze of mental and physical factors as you continually process information, deal with failure and face another pitch or another at-bat. What should the process look like instead? A hitter misses a few eHack pitches due to the higher velo. He takes a deep breath, clears his mind and does the hard take drill on the next pitch. Or maybe he grabs med ball for his front foot to help with timing and rhythm. Instead of speeding things up and cranking up effort, he does the opposite. He simplifies and slows things down. He does not extend a bad round with “one more”. He gets out after 8-10 pitches. After the round, he goes to to the open area beside the cage and uses the Swingaway station or dry drills to reinforce good swing patterns. Maybe he checks out his Diamond Kinetics data to understand what is going on with eHack swings versus BP/Front toss swings. He checks to make sure that Barrel Speed, Approach Angle, Hand Cast and Time in Zone are the same (hint — they probably are not!). Then, he shares the information with Coach Cooper, Aboussie, Beckmann, Keeney, Schrimpf or Rosen. We know this change in practice approach is hard. We are challenging you with game velocity and movement in practice on a regular basis. With the right mental approach, this can be a lot of fun and you are going to get a lot better. The mental aspect of this is a big deal. Over the past year we have talked a lot about GRIT and Heads Up Baseball 2.0. Those are great resources to start with if want to improve your mental process around this. Is summary, failing off the eHack at game velocity and movement provides a unique opportunity for you to work on your mental game and get better as a hitter. OPPORTUNITY IS KNOCKING. The Gamers coaching staff has spent a lot of time learning and talking about how to coach Gen Z athletes (kids born after 2000). This is now our entire group of high school age players. This generation of young men is different (Click Here ). The most astounding difference is this: they are the first generation in human history that does not rely on adults (parents, teachers, coaches) for information. That raises the bar on the role that adults play. Luckily the Gamers coaching staff includes a number of educators that are on the front line in high school classrooms teaching and interacting with Gen Z students. Gen Z players are energizing to coach, because they force us to do things differently — and better. But we have to be willing to change! These changes needs to be substantive and real. Not silly youtube videos, shallow Instagram images or related social media noise. Gen Z players deserve much more than this. Gen Z players learn by doing and seeing, not listening. Our practices are full of live action drills and not a lot of talking. Drills are becoming more live action simulated game situations, on the mound, in the field and at the plate. Constraints-led coaching and non-linear pedagogy is now incorporated into every element of our practices. OK — we were doing some things like this before Coaches Beckmann and Aboussie told us what is was called. Now we are doing it even more. Cones, med balls, weighted balls, weighted bats, resistance bands, uphill mounds, etc … are everywhere. We are providing an practice environment for players to use their own muscles and neurological system to “figure it out” in dynamic situations. Our coaching staff is now constantly coming up with dynamic, non-linear drills. This is why our 150 minute practices fly by. Immediate data feedback is everywhere. The players understand the goal of their athletic movement, and they are provided immediate feedback, in many cases through a screen, bluetooth device or a visual cue. They then use their natural athleticism to make adjustments based on the feedback. It is very impressive to watch these athletes make themselves better with feedback. We are interacting with them on their mobile devices across a number player apps, ranging from Sportsengine and Twitter to TrainSmart, SwingTracker and Hittrax. We now encourage them to bring fully charged smartphones to practice. What a change over from just three years ago! Different words and cues from coaches. More questions than statements. How did that feel? How was that different? Why were those numbers better? Gen Z players want to be fully engaged in the process, not just the target of shallow compliments, high fives or criticism. These kids are too smart for shallow coaching. The Gamers program is built on process, so it’s a great fit! Personal Responsibility & Accountability. Gen Z players are independent. They need to do it for themselves. Our job is to give them the right resources, right support and right environment. From there, the Gen Z player is on his own to succeed or fail. And most of them would not have it any other way. Self-reliance and independence are great traits in athletes. Holistic Approach — this is not just in baseball practices. The Saturday team workouts following practices adopt the same philosophies. If you have ever seen the Speed Treadmill, you know what we are talking about. Same with our college process, nutrition program and weekly life lesson sessions. All elements of the program are incorporating these principles. This journey with Gen Z players is fun and energizing. The changes that we are making as a program are significant and important. Gen Z players are making the Gamers program even better. And, they are a lot of fun to coach — once you figure them out. Below is an excerpt from great resource about leading Gen Z kids. Highly recommend that parents/coaches read it. Keep it short. Remember, they have strong filters and short attention spans. They can binge watch Netflix for hours, so they can pay attention to a long stint of content. The key is to engage them within six seconds. That’s how much time we have for them to make up their minds about engaging with us. Make it visual. They are visual learners. Images are the language of the 21st century. Images are the language of the 21st century. Among teens, Instagram is the fastest growing social media tool. In short, pictures beat words. This means we’d do well to anchor our big idea with a metaphor, or better yet, with an actual image or visual on a screen. Feed curiosity. Whet their appetites. They want to discover new content and pass it on. Build a hunger for interesting facts, and relay why some are important to know. The numbers tell us they’re naturally curious, consuming Buzzfeed and all sorts of daily data. Feed it and channel it in a positive direction. Give them ownership. Students support what they help create. Help them own the message. Don’t do the work of learning for them. 5. Make it interactive. They love connecting socially. Place them in small communities to talk. They are an “upload” generation who wants to talk, create and offer their opinion. So let them. While it takes longer to teach something with interaction, it sticks longer as well. If you want retention, foster interaction. Gamify your content. Make your message an interactive game with quests, points and badges. A huge percentage of Generation Z is gaming in some way. Try utilizing points, competition and achieving badges (with or without technology) to position them in their natural habitat. Learning has gone from Gutenberg to games. Offer a cause. Most kids want to do something very important and almost impossible. This has always been true for adolescents. They have a natural bent for risks as their teen brain (the frontal lobe) develops. Why not use this for redemptive purposes? Give them something meaningful, not hypothetical, to pursue. This is a post sent on April 1st for the past 7 years. We have now had hundreds of players go through high school baseball as freshmen and sophomores. Some have had great experiences. Others have had bad experiences. It is important to have your expectations set properly and go into the high school baseball experience with the right mindset. In fact, we have a LOT of players commit to college baseball programs BEFORE EVER PLAYING AN INNING OF VARSITY BASEBALL. This is what pursuing excellence is all about. You compete against yourself to get better, day by day, regardless of the level of competition you are facing. This is how you can take control of your high school baseball experience. Our challenge (in everything) is to perform to our potential in activities that we care about. Of course, as Gamers, we are constantly working hard to expand and increase our potential — through training, nutrition, practice and being students of the game. We are trying to hit a moving target, which is our Potential. Performance is how we actually play and can be easily measured or observed. Potential is obscure, but performance is easy to see. Your performance is the answer to the question “how good of a player is he?.” That question must be answered with actual results — not obscure potential. The ultimate assessment of a player is what actually happens on the field. That is a tough reality. 1 – Play Big program which is focused on overcoming fear and other emotions that interfere with playing to your potential. The new Heads-Up 2.0 program from Tom Hanson and Ken Ravizza builds on this for more advanced players. 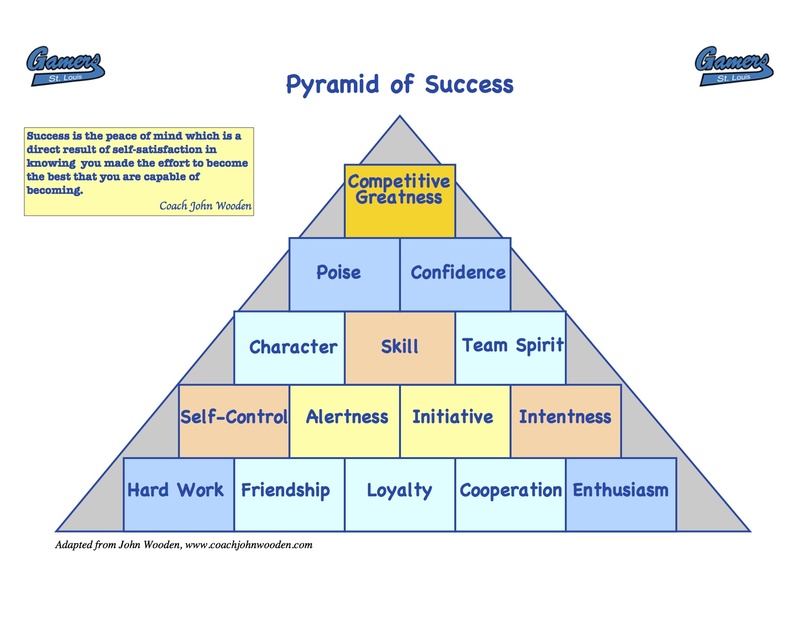 2 – Pyramid of Success which is 14 Personal Traits that are the building blocks to success in team sports (borrowed from John Wooden). 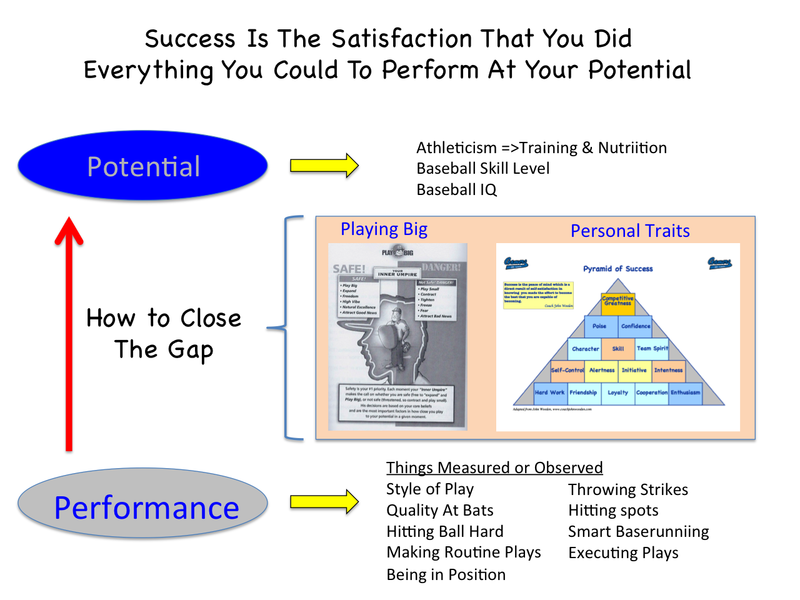 If your PERFORMANCE GAP is big, then you need to address issues around Playing Big and/or the Pyramid of Success. Simple recipe but hard to do. Too often, teenage boys seek the easy way out — looking for excuses, passing the blame — instead of accepting this personal responsibility. This is a very important lesson to learn and separates young men from mediocrity. The end product is worth it for players who accept this responsibility. This is now the 9th year I have published this post for Freshman Gamers. This post is for all 15u (current high school freshmen). Parents, please make sure that your son reads this. This is a friendly reminder from the Gamers program that we care about you and your success. 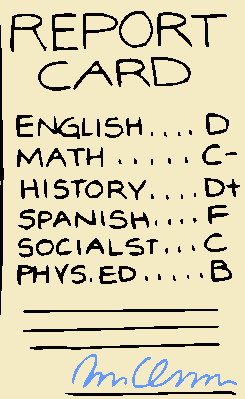 Grades matter. If you want to play college baseball, grades matter A LOT. Time after time, we see that GPA’s and test scores make the the difference in the college recruiting process. Coach Whiteside reviews the chart below in the Gamers college process meeting every Fall. College coaches never ask about Batting Average or ERA. They ALWAYS ask about GPA. Now that you are a freshman, your grades now count toward your high school GPA. A year from now college baseball coaches will start looking at you. One of the first questions they will has is “how are your grades”. Three years from now, you will be filling out college applications. Every college application will ask for your GPA and a copy of your high school transcript. In baseball, your skill level and athleticism as a Freshman don’t matter a much as your skill & athleticism as a Sophomore and Junior. You have some time to work on those. Unfortunately, GPA’s are different — they are cumulative. Sometimes, freshman do not realize this simple fact — your grades as a freshman count JUST AS MUCH as your grades as a junior or senior. The result of this would be an overall GPA of 3.4. Pretty good (our 15u-17u Gamers have an an average GPA of 3.5). AND, when college coaches are actually recruiting this kid his GPA would still be under 3.0 because of his disasterous Freshman year. It is now November You are well into your first semester of high school. If you are doing well, congratulations and keep up the good work!! If you are not doing well so far, fix the problem RIGHT NOW. Talk to guidance counselors, teachers and your parents. Get a tutor. Show that YOU CARE. Fix the problem before it gets too late to impact first semester grades. Your grades are not going to change unless you change something. It is your responsibility. Blog post from 7 years ago now. The italics are only addition. Since the days of snake oil salesmen, people have been trying to sell the “easy way out” potions and formulas to a willing audience. It is human nature to look for the easy way out, the easy weight loss diet, the easy way to get in shape, the easy way to make money, the easy way to find a mate, the easy way to do about anything …. This now includes the easy way to play baseball at the next level. The Gamers program is built around Hard Work and Passion. These are the cornerstones of our pyramid of success. Along with Commitment and Loyalty. We practice a lot, work hard and have high expectations on and off the field. We depend on each other to succeed. In our opinion it is the right way to do things, regardless of how talented players may be. Even the most talented players need to work hard — because being talented in St. Louis does not translate into being talented and successful at the next level. There is “no easy way out” in the Gamers program. This is our image and reputation in the youth baseball market, and it is true. This is almost comical. Get better, by working less. Snake oil potions, combined with some multi-level Amway marketing. How do you tell if it’s snake oil? Pretty easy, just listen to what is being said. Things that are meaningful in life are not supposed to be easy. It should be difficult. You don’t “enjoy the journey” on cruise control, by not being 100% engaged and overcoming challenges. IT IS SUPPOSED TO BE CHALLENGING! Some parents and players fall for the sales pitch. Like the magic weight loss, hair growth and smart pills from frontier days. Sounds great for parents — a lot less driving around and fewer practices, maybe even lower cost. Sounds great to players, sit by the pool and relax all summer while becoming an elite athlete. Don’t believe the snake oil salesmen. You cannot lose weight unless you eat less and/or burn more calories. Sorry Dorothy, but the Wizard is just a man hiding behind a curtain. There is no easy way out if you want to be an elite baseball player. Especially, here in the Midwest, where the baseball season is too short and you do not get nearly enough reps by just playing. If you are extremely talented, you may get to the next level on raw talent alone. But, you will not succeed at the next level unless you understand Hard Work and Passion. There is no easy way out if you are pursuing excellence and competing against yourself to be the best you can be. It takes hard work, a lot of practice, challenging coaches, high expectations and a lot of dedication. It takes commitment, it takes two-way relationships. That is the magic formula. There is no easy way out. Re-post: WINNING THE 0.50 SECONDS! Baseball action happens in 4 second intervals. This is the time it takes for an athlete to run 90 feet — so it is a fundamental design element of the game since it was created. A groundball to the infielders must be fielded, thrown and caught in 4.0 seconds — which is the time it takes the runner to get down the line. 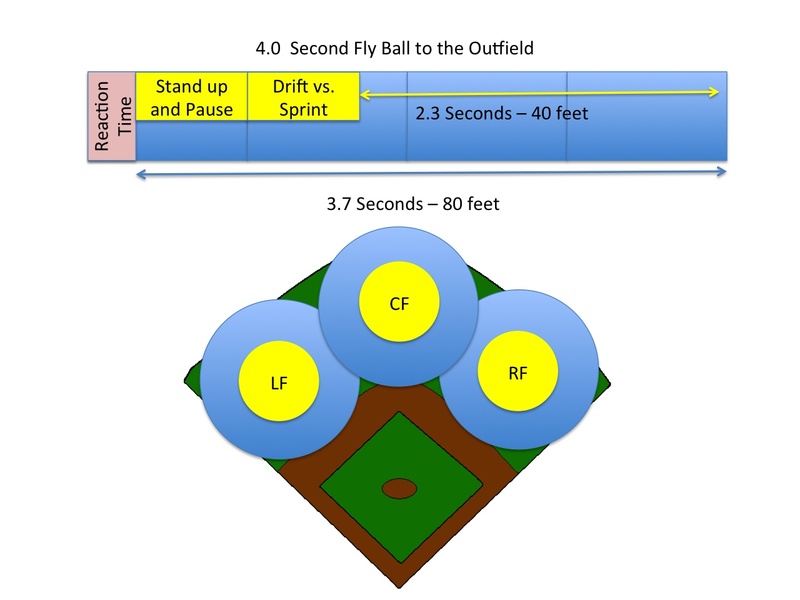 A well hit ball in the air to the outfield will travel in the air about 4 seconds, longer if it is high pop-up. An outfielder has 2 x 4.0 seconds to throw a guy out going from 1st to third — 4 seconds to catch the ball and 4 seconds to throw it 220 feet to a tag out. So, where does that 4.0 seconds go? Well, it takes an athlete at least 0.3 seconds the visually see, process information and fire muscles. So, that leaves just 3.7 seconds to make the play. 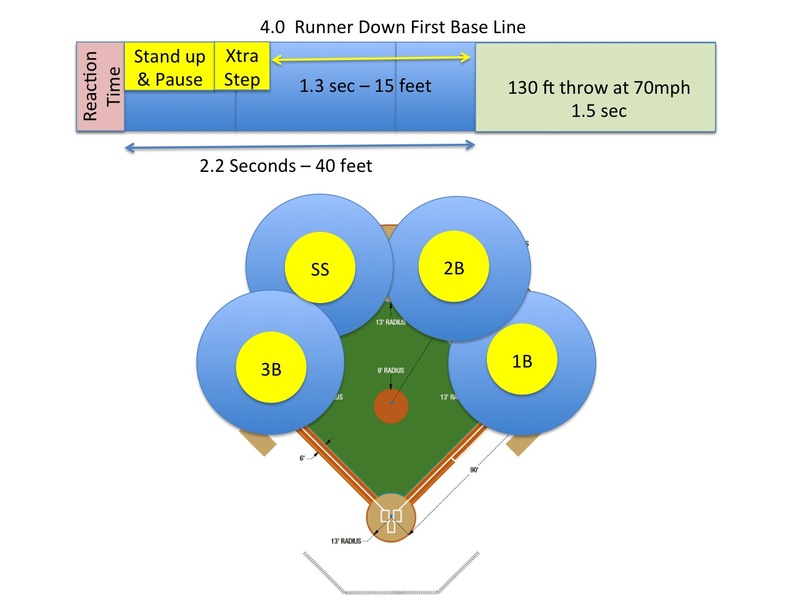 Watch a young fielder and this is what you see … After the initial 0.3 sec reaction time, the fielder takes an additional 0.5 seconds before reacting because he either was not really ready to react OR he is unsure of himself and wants to see the ball more before reacting. When he does this, he usually straightens up and visually pauses. So, that is 0.5 seconds of lost time. Then fundamentals come in to play — as an infielder, he will be inefficient to the ball, taking 1-2 extra steps and giving up time. As an outfielder, he will drift to the ball, instead of running full speed to a spot to make the catch. So, time and fielding range is reduced proportionally. – You need to be ready to react, immediately. This means that as the ball enters the hitting zone, your muscles are ready to fire explosively, like a sprinter. – You need to anticipate the ball off the bat, reading bat angle, and ball angle even BEFORE contact. Really advanced fielders do this. Repetitions are the way to learn this. – You need to trust yourself. Your first instinct will be right 95% of the time, don’t waste 0.5 seconds trying to be right 100% of the time. It is not worth it. – Relax and breathe… in pressure, tense game situations, your breathing becomes shallow and your muscles tense up. Tense muscles with low oxygen cannot react. Win the 0.5 seconds and your range and fielding success will go up immediately.